I think I have kumquat ADD. Several weeks ago, my pal Catherine bequeathed upon me a hefty sack of kumquats from her best friend's rather prolific tree. 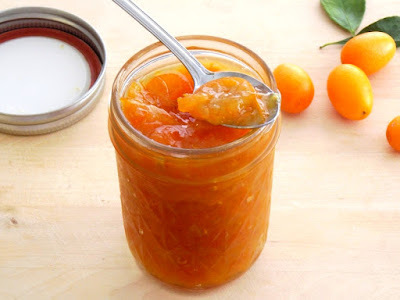 I made a fantastic kumquat marmalade and played around with other canning experiments, but mostly I just popped an embarrassing number of them in my mouth. I savored these little fruit gems like they were candy as I chopped, stirred and canned, thinking I had thousands left over to turn into sweet, candied bits for the Meyer Lemon Cheesecake Shots with Candied Kumquats photo makeover. After all, a little goes quite a long way in kumquat land, right?. But as the last few tiny citruses unleashed bursts of mouth-puckering juice onto my tongue, I realized I'd snacked myself into a corner: I'd not only used, but consumed all of my kumquats. I hung my head in shame, knowing I'd have to put off another blogging task, but also wondering when I could have my next fix. Like a good dealer, somehow my kumquat-gifting friend knew that I was out and showed up shortly after my embarrassing binge with another bag heavy with the little bright orange fruits. "What are you using them for?" she asked, a little confused by how quickly I'd used the first huge stash. "Oh, I'm just canning them," I lied, fingers crossed behind my back. I just couldn't admit to such shameful kumquat binging. After preparing more kumquat marmalade & chutney with the new stash, I made another attempt at making the cheesecake shots. But the stormy weather was so lousy, with howling winds and torrents of rain pouring from the sky, that it just seemed like a much better day for baking. Not wanting to waste the cream cheese I'd set out to soften, I thought it might be fun to make some sort of cream cheese & fruit muffin. And with the sweet scent of kumquat marmalade in the air, I knew exactly what I'd be using for my new little experiment. I love baking with cream cheese (or in my case, Neufchatel; it has a slightly different flavor and is lower in fat calories) because of the different texture it gives to the final product. The crumb is slightly more dense and the mouth feel more velvety than baking with butter. It also makes cakes or muffins taste more rich & smooth, which is why sweet-tart fruits are such perfect complements. Usually, cream cheese muffins are paired with berries, but I found that the kumquat marmalade was just as delightful. 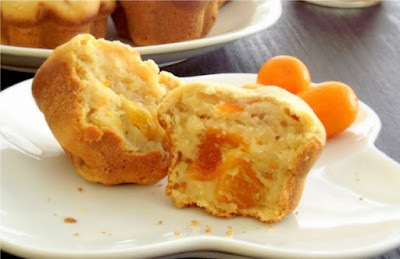 Though the marmalade on its own is tangy sweet, its flavor is smoothed out by the cream cheese batter. And since I like to keep my marmalade chunky, the large pieces of fruit make for a pleasant little surprise in every bite. If you don't have access to kumquats or they're too expensive where you live (the lowest price I've seen in this area is about $6/lb), find a friend with a tree! I'm serious. Chances are the tree has too much fruit and your pal might not have time to use them all. Don't have access to one of those? No worries. 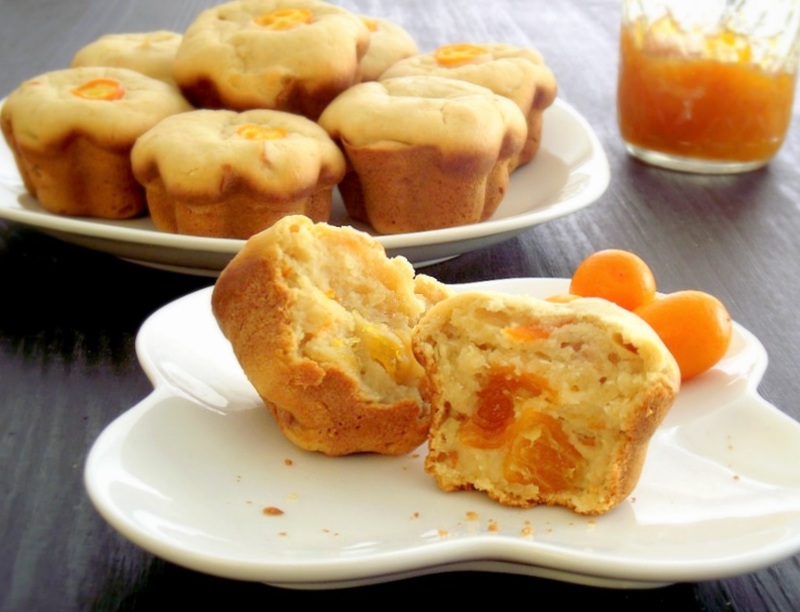 These muffins will probably be just as tasty made with orange marmalade; just be sure to get the kind that has plenty of orange rind in it (Smucker's is your best bet for that), in order to get as much citrus flavor as possible. Preheat the oven to 350°. Prepare a muffin tin by lining it with muffin liners or greasing well. Set aside. Combine the dry ingredients in a medium bowl and stir together. In a separate, larger bowl, beat together the cream cheese, butter and sugar with an electric mixer until light & fluffy. Add the egg and milk and mix well. Next, add the flour mixture to the wet ingredients a half cupful at a time, mixing well in between batches. Lastly, fold the kumquat marmalade into the batter gently, making sure not to overbeat. Drop large spoonfuls of batter into each cup of the muffin tin and top with individual kumquat slices. Bake for 25-30 minutes, or until a toothpick comes out clean. Serve with extra kumquat marmalade and enjoy! Rinse the kumquats in a colander and pat dry with paper towels. 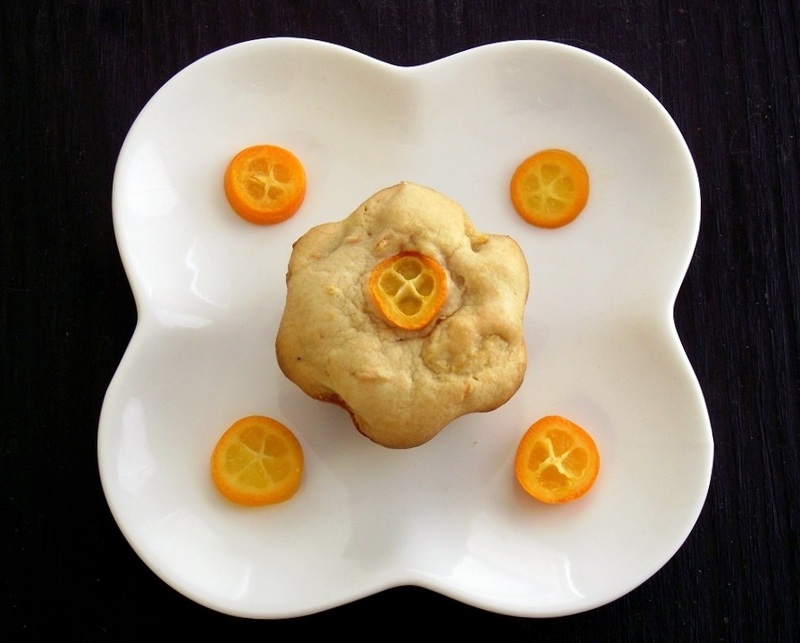 Cut off the ends, then slice each kumquat lengthwise, remove the seeds, and cut the halves into quarters. In a large saucepan, combine the water, sugar and lemon juice and bring to a simmer over medium heat. Reduce heat to medium low and continue to simmer for 20-25 minutes, stirring occasionally. The mixture will start to thicken on its own as you are cooking, and will continue to thicken as it cools. Allow the marmalade to cool to room temperature, then pour into airtight containers. It can be refrigerated for up to 2 months and frozen for up to 6 months. Serve on muffins, toast, scones, or use it as a base for sauces in other recipes. But most of all, enjoy! And now I know the truth! That's why you've been pestering me to go get more! Wow, that all looks outstanding! Hooray! I've found a recipe for my kumquats! I bought them on a whim with no plans and I'd hate for them to go bad. This one looks great! The muffin looks wonderful. I like the kumquat marmalade add. Both of these recipes look amazing, I don't think I've ever done anything with a kumquat other than eat them! Thanks for making marmalade making so easy! Although when do I add the kumquats/fruit to the water-sugar-lemonjuice mixture? After the initial simmer or right at the start? Kumquats are such a bizarre little fruit... never thought of cooking with them, only inhaling cartons of them whenever they're on sale at the supermarket. I will keep this recipe in mind for the next time they go on sale though! I made this yesterday with a couple of slight revisions. Didn't have kumquats so I added apricot jam (only fruit, no sugar) and then added dark chocolate chips melted on top for a icing. They were delish!! 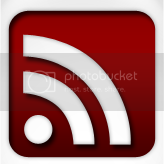 I enjoy your site...thank you! !